Although this variation of a casino favourite is one of the oldest forms, it has often fallen behind the European and American variations. But the popularity of French roulette is growing, and more Canadian online casinos are offering it than ever before. We thought it was only right that Roulette.ca then offered up a user friendly guide on the topic, to demystify the game for newcomers and help veteran roulette players discover a new favourite. As well as our most frequently asked questions answered, so that you can spend as much time as possible playing your newly found favourite game. The basics of French Roulette will be familiar to anyone who has played any variant of the game, either online or offline. There is a wheel with the slots containing numbers 1-36, half of them red and half black, and 0 (there is no double zero, which makes French Roulette different to American Roulette), which is spun in one direction. A ball is spun in the opposite direction, bets are placed on where it will land, and players win or lose depending on which of the 37 slots the ball lands in. The felt on which the players place their bets is entirely green, unlike some other variants of roulette where it is colour-coded to match the numbers on the wheel. However this does not mean online roulette players cannot use the same 'red or black' bet as in other versions of the game. 'Even-money bet': 'Red or Black', 'Odd or even', or 'Low (1-18) or High (19-36). This pays out 1:1, or 'even-money'. French Roulette has two unique rules which make it distinct from other variants, and the first of these is known as 'La Partage'. This rule offers players insurance whereby if they make an even-money bet and the ball lands on zero, they only lose half of the amount staked. The second unique French Roulette rule is called 'En Prison'. This also relates to the ball landing on zero after an even-money bet. However instead of forfeiting half the bet, players can leave the bet 'in prison' and try yo effectively win it back on the next spin of the roulette wheel. The 'En Prison' rule is popular with players who have a lot of gamble in them. As the name suggests, French Roulette originated in France, the country commonly regarded as the home of the game. Even the word 'roulette' is French, meaning 'little wheel', and some suggest the first version of a roulette wheel can be traced back to the 17th century mathematician Blaise Pascal. However the game in its current form seems to have its origins in the late 18th century, with reports of its use in Paris' Palais Royal. Like its American equivalent, French Roulette started out with zero and double zero, however this was removed some time during the 19th century. The online version of French Roulette has always been played with a single zero. At brick and mortar casinos in Canada, American Roulette is the most popular, and in many cases the only version of roulette available. Due to the presence of the double zero, this game provides more of an edge for the house and is naturally more popular with the casinos. However players need not worry, as French Roulette is readily available on a whole host of Canadian online and mobile casino sites. Other variants are also available, but French Roulette offers elements not found elsewhere, often bringing a greater return on investment and helping you get more play for your money. French Roulette is the granddaddy of all Roulette. While it waned over time in popularity, it is making a comeback due to the increased odds for Roulette players. The French variety is most closely related to the European format, as it only has one zero. The difference lies in the La Partage and En Prison, meaning that players can wager a protection bet in the event that the ball drops on single-zero. If a player wagers on La Partage, then should the ball drop on zero, then they receive half of their bet back. If they partake of the En Prison rule, then players can leave their money and potentially win it all back with the next spin of Roulette. 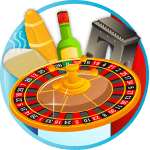 When playing French Roulette, players will find the table and the wheel to be like the European variety. All of the bets and the odds are exactly the same except for the opportunity to bet La Partage and En Prison. The overall popularity of French Roulette is not as impressive as the European variety. Many casinos do not offer the French variety due to the drop in the house edge, which goes from 5.26% with the American, to 2.7% with European, down to a 1.35% for the French variety. Despite the decrease in French over European or American, it is still available online, and we have found some great sites that do in fact offer French Roulette. So go ahead, give La Partage and En Prison a try. We think you will enjoy it. The primary difference is the La Partage rule and the En Prison rule, which are protection bets in the event that the pesky zero shows up as the winning number. Typically, when the ball lands on zero you lose your wagers, so to have your numbers protected is a good thing. After all, there is a 1 in 37 chance that a zero will show its pretty little face. The odds of winning go from a house edge of 2.7% with European Roulette down to a house edge of 1.35%. In order for a player to benefit from this change in edge, the player needs to play La Partage or En Prison. Many Roulette players will suggest that wagering a protection bet on zero is not a wise investment. However, there must be some overall advantage considering the house edge average reflects a significant difference. There are many systems that can be implemented to increase your chance of winning at Roulette. Most professional Roulette players adhere to bankroll management. In other words, never betting more that 3% to 5% of your total bankroll on a spin. The idea is that the longer you are able to stay in the game, then the better your odds of winning. What is especially good about online Roulette is that wager size can be as low as pennies to larger wagers dependent upon your style of play. Roulette players cannot get that at land-based casinos. There are many systems from the Martingale to the Paroli system, and each of them basically come down to the same approach: only play with money you actually can risk losing, maintain your bankroll for as long as you can, and never bet more on a single bet in hopes of chasing the win. French Roulette can be played at select online Roulette sites. Fortunately for you, we have located some stellar sites that speak the language of French Roulette. Get ready to enjoy En Prison and La Partage, all the while winning real money at safe and secure sites. Don't forget to choose sites that offer great bonuses. That is the perfect way to increase your time at play. Is it different to European Roulette? There is little difference between French and European Roulette as far as the table and the wheel goes. However, the main difference lies in the En Prison and La Partage rules that allow for players to go one more round without losing their bet with En Prison, or getting half of your total bet back with La Partage. Not losing your full bet over time can really add up.